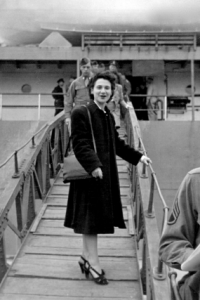 NEW YORK — Beate Sirota Gordon, one of the last living members of the team that worked under Gen. Douglas MacArthur to draft Japan’s post-World War II constitution, passed away at her home in Manhattan on Dec. 30 at the age of 89. In the writing of Japan’s new constitution, which took effect in 1947, Gordon played an integral role, drafting the language regarding legal equality between men and women in Japan, including Articles 14 and 24 on equal rights and women’s civil rights. Recognized as a feminist heroine in Japan, Gordon wrote “The Only Woman in the Room,” a memoir that looks back on this and other episodes from her life. Born in Vienna in 1923, she was the only child of noted pianist Leo Sirota and Augustine Horenstein. She went to Japan in 1929 when her father was invited to teach at what is now the Tokyo National University of Fine Arts and Music. In 1939, Gordon moved to California to study at Mills College in Oakland and became a U.S. citizen. After graduation, she worked as an assistant at the Time magazine in New York before returning to Japan in 1945 as an interpreter and translator, serving the General Headquarters of the Allied Forces that occupied the defeated nation. In addition to English and Japanese, she was fluent in German, French, Spanish and Russian. Moving to back the U.S. in 1948, she married a fellow GHQ interpreter, Joseph Gordon, and they raised a son and a daughter. Mr. Gordon died last August; Mrs. Gordon is survived by her children and three grandchildren. In 1953, Gordon started the Performing Arts Program at the Japan Society in New York. 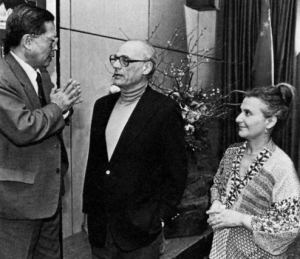 During her tenure as director of performing arts, which lasted until 1981, many well-known Japanese artists made their American debuts at the Japan Society and often gave return engagements after their careers had been successfully launched. Later, Gordon became director of the Performing Arts Program at the Asia Society (1970-1991), eventually becoming the director of performances, films, and lectures. A recipient of the Order of the Sacred Treasure, Gold Rays with Rosette, from the Japanese government, she was a frequent speaker and participant in Japan Society events and programs throughout her later years. “Beate had the uncanny ability to spot the star quality of avant-garde Japanese dancers such as Eiko and Koma, whom she premiered in 1976, while also recognizing the immense beauty of a voice of a Korean pansori singer. Today, when Asian dance and music seem ubiquitous all over the United States, it’s hard to remember that Beate Gordon played a singular role in introducing the finest forms of Asian performing arts to American audiences through her role at Japan Society and at Asia Society for more than three decades. Dancer/choreographer Eiko Otake recalled, “Beate brought performing groups from so far away. Many of them had never left their villages before. How stunning these dancers, musicians and actors were! In addition to performances in New York, she also toured these artists to other cities in the U.S. Thus for two decades, many presenters and audiences were surprised, impressed, and affected by the art forms coming from very different cultures and lives in Asia. People were also educated by how she presented these artists. “Attending Beate’s concerts, Koma and I learned so much about performing arts and about Asia. We felt connected to the rituals, bodies and faces of these people who came from places much further than Japan, distance-wise and lifestyle-wise. We grew up in Japan as Japanese, but in New York we felt we were becoming, or rather uncovering ourselves as, Asians. To see more tributes, visit http://asiasociety.org. Ms. Beate SIROTA GORDON was not “the last surviving member of that small cadre of American Occupation officers and civilians who drafted Japan’s post-war charter”. At least one other member, Mr. Milton J. ESMAN, is still alive. Thanks for letting us know. The article has been corrected.